Christian Dior Addict Eau Delice 2012 is a bright, luxurious, light & seductive. Christian Dior Addict Eau Delice 2012 100ml. Eau De Toilette - new provocation from the House of Dior makes women even more welcome and seductive! And if Dior Addict - is a shining gold, the Dior Addict Eau Delice - this pearl with its muted soft glow. Giving a light gleam fruit shades, this perfume confuses our senses cranberry notes, pomegranate syrup and a delicious trail of white musk. This shower of pearls! Song: ylang-ylang, cranberry, white musk, Egyptian jasmine, Indian jasmine. 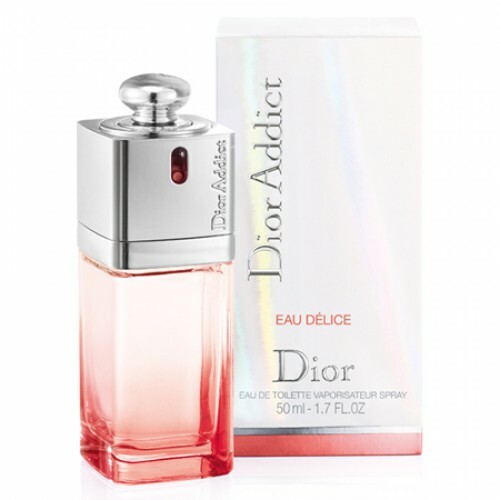 Dior Addict Eau Delice - new floral fragrance for women 2013 spring-summer 2013. format in the toilet water, another flanker Addict 2002, the third, after Addict Eau Sensuelle and Addict Eau Fraiche, this perfume house which was released in 2012. It is a bright, luxurious, light and seductive floral-fruity eau de toilette, which differs with freshness and elegance. Experts have tried and have presented a composition which is filled with femininity and sunny mood, radiates joy and happiness, is designed specifically for the summer, romantic and adventurous, bright summer dresses and beach season. Such a wonderful symphony opens gourmet sweet and sour cranberry chord. The heart notes of white flowers lurk - fresh jasmine from Egypt and India, and ylang-ylang. At the end is formed is soft and fluffy cloud of white musk. Addict of Eau, Delice is focused on ease and daring, charming and elegant, seductive and volatile girls who are ready for adventure, always cheerful and carefree, do not deny their desires and impulses. , In order to design the bottle which presents an enchanting aroma, the creators of a tropical coral shade has been selected.